Battle Game of the Month: More Imagining, Planning and Experimenting. I would probably call those vessels a schooner (or just possibly a lugger) and a cutter - the sort of small craft you want for inshore work and protection of coastal shipping and seaports. Oh, and for quick off-shore raids on enemy shipping that stray too close to one's own shores. 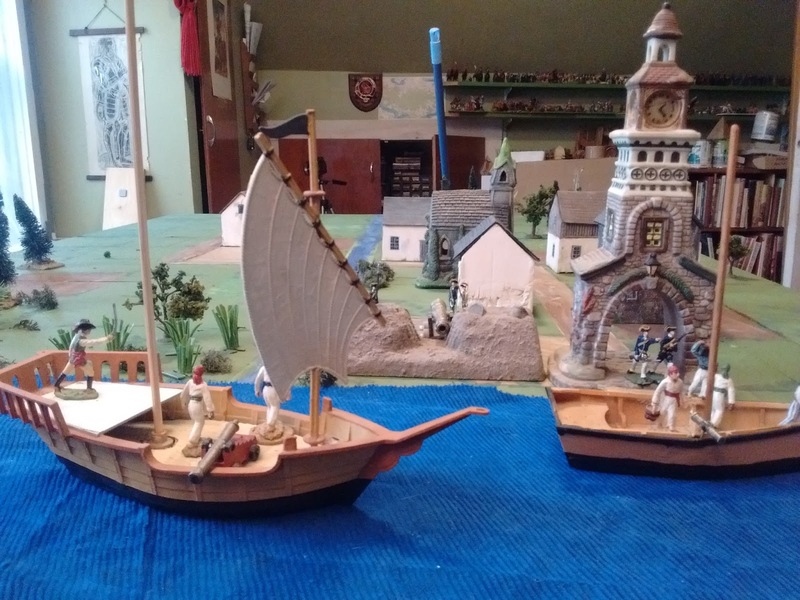 Yes I meant to call the single masted boat a cutter, schooners have 2 masts, its just a bad habit picked up when I first did a 5 minute improv conversion of two souvenir Dories for a game. The larger ship will actually be a brigantine when finished with square foresail and lateen mainsail though it seems that in the 1740's the terminology was less strict and Brigantines were sometimes referred to as Brigs esp by landsmen. These were apparently the most common multipurpose vessels in New England. None of these would be strictly coastal vessels though, not enough coastal settlements to pay. Their main uses were either trade to the Indies or Europe for the larger vessels, fishing for the smaller ones and privateering for both whenever hostilities erupted. They are both heavily bath tubbed and definitely toys not models. This just looks delightful. 2017 is going to be fun. I hope so, for me anyway. Wow, splendid ships and coast!